There's a scientific ranking of the best alternatives to traditional pets. Whether it was during recess more than a decade ago or last night at the bar, you’ve likely been thrown this question: If you could have any animal as a pet — any animal — what would you choose? Maybe the more refined imagine their lawns filled with haughty pink flamingos; the more adventurous consider how nice their home would be if only it had a bear. Celebrities, despite all the evidence that it’s a poor idea, sometimes take the fantasy and turn it into their reality — think of Justin Beiber and his poor monkey, or Mike Tyson and his infamous tigers. A team of Dutch researchers scientifically tested that question and evaluated the pet suitability of a variety of mammalian species. “Pet suitability” here was assessed by judging the animal’s behavioral and health needs, how they behave in captivity and in the wild, and the risk a human relationship would have on their welfare. Bibliographic data was amassed to create one-line criteria statements, which were then ranked determining on the score three teams of scientists gave them based on the other measurements of suitability. 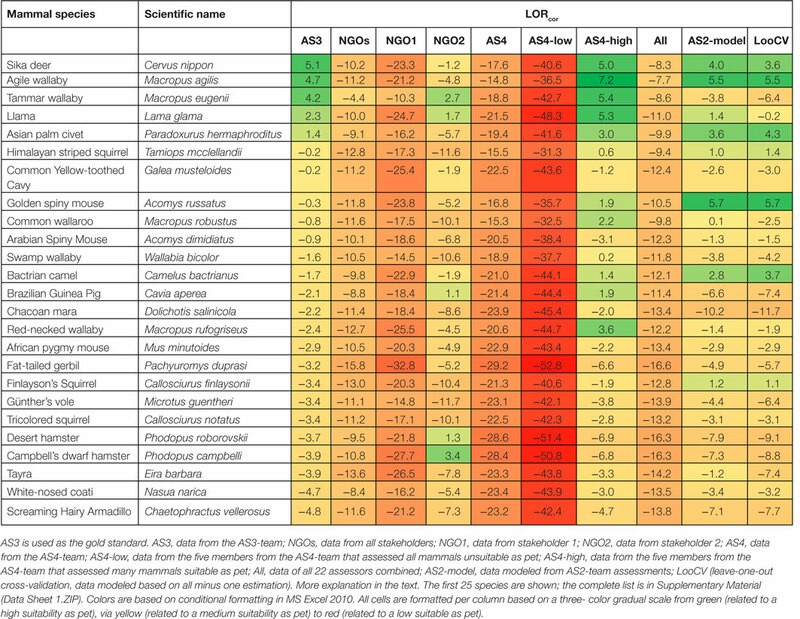 The ranking of these 90 mammalian species were determined by three teams — one which selected the one-line statement describing the animal, another that assessed the strength of the statement regarding behavior, health, welfare, and human-animal relationship, and a third that took all of that information and assessed the suitability of the animal as a pet. In the journal Frontiers in Veterinary Science they published a list of the top 25 animals they think would be the best pets (note that this doesn’t mean the scientists think they should actually become pets). Lead author Paul Koene told the Frontiers blog that he “does not envisage that Agile Wallabies will replace dogs and cats in man’s affections anytime soon.” There is also the question of how closely these animals’ behavior would stick to what it is now if they became pets. Animal cognition and behavior, after all, is altered by domestication — studies of dogs and foxes reveal that domestication causes animals to not only lose their wild-type behavioral responses to humans but also their gene flow. This isn’t taming — this is biological alteration. This isn’t necessarily a difference in happiness — it’s that through hundreds of years of selective breeding and captivity, domesticated animals are biologically designed to be less stressed than wild animals. Studies demonstrate that while on average captive animals are healthier and live longer, that isn’t true for all species. Here are the top five in order of best suitability, along with pictures of their corresponding cuteness. Sika deer: Pretty small for a deer, Sika deer graze in small herds and mostly eats grasses and herbs. They are native to Japan, China, and Taiwan but have been introduced to other countries like Australia, Germany, and the United States. Agile wallaby: The most common sort of macropod in tropical Australia, agile wallabies live from about 11 to 14 years whether or not they are in the wild or captivity. Llama: These were surprisingly not considered to be on the “production” animal list although they’ve previously been described as having “all of the good things about dogs, but none of the hyperness.” Llamas also hum. Asian palm civet: Although they look somewhat feline, civets are more closely related to weasels and mongooses. Also known as the Toddy Cat, the Asian palm civet is a carnivorous animal and have faced some pretty horrific abuse from humans. Special mentions for some other animals on the list: the Bactrian camel, African pygmy mouse, and the Screaming Hairy armadillo. The researchers wrote this paper in light of the Dutch Animals Act and in anticipation of potential welfare problems. In the 2013 Interaction of the Animals Act it is prohibited to keep mammal species as pets — save for production animals, dogs, and cats. The Animals Act also recognizes animals as “beings with feelings” and states they should be guaranteed certain freedoms — that they should be free of thirst, hunger, pain, injury, and disease; as well as fear and chronic stress. A portion of the final rankings chart. What’s next for this team? 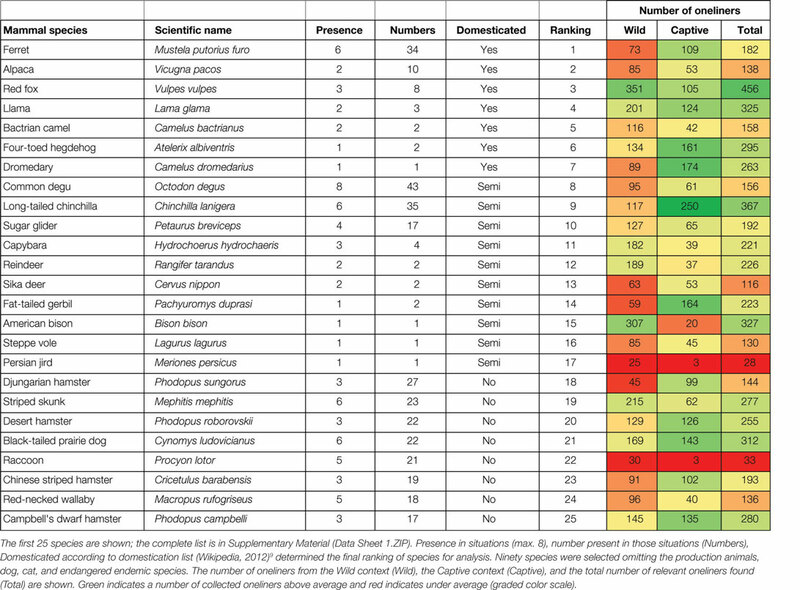 Completing a full list — 270 other mammals (they are still figuring out how to determine the suitability of birds and reptiles).